In the Dirt: Will There Be A Moose Call? Will There Be A Moose Call? With the Yankees getting closer and closer to that coveted playoff spot the burning question is: Who will be the fourth starter should they make the playoffs? With Andy Pettitte likely to pitch the first and fifth game of the series Torre picked Chien-Ming Wang to start game three. The reasoning behind this is because the wild-card team will play game three at home and Wang’s ERA is more than a full run lower at home compared to on the road (2.85 at home and 5.05 road). Roger Clemens is the obvious choice for game two, which of course comes with the assumption that he is healthy enough to pitch. So the only thing left to figure out is who would pitch game four? 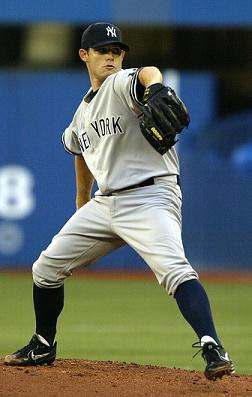 The pitcher for game four will most likely be one of three players: Mike Mussina, Phil Hughes, or Ian Kennedy. With the way Mussina has pitched this season it seems he is unlikely to get the call, but Joe Torre loves veteran presence especially in the playoffs. Remember last season when Torre started Bernie over a more deserving Melky Cabrera? So the Moose is the most likely to get the nod, but just because he is the most likely doesn’t mean he actually will. Mussina’s last start against Toronto was very strong. He pitched 5 2/3 innings and didn’t allow a run, but his three starts prior to that left a lot to be desired and Torre eventually pulled him from the rotation so he wouldn’t put playoff hopes in jeopardy. Will Torre let veteran bias interfere again during the playoffs? The Moose could make all of this a non-issue by going out to the mound tonight against the Orioles and pitching the way he did in Toronto. If that three game stretch where he had an 17.68 ERA was just a fluke then it will solve this entire situation. Of course if he gets bombed again then you have to look into other options. Hughes is probably the next most likely to be handed the ball for game four. After a rough return from the DL he has been pitching well lately thanks to his old pitching coach Dave Eiland. Since his arrival in the Bronx Hughes is 2-0 with a 2.55 ERA. Last night he pitched well against Baltimore going 5 2/3rds innings and at times he was dominant retiring 14 of 16 batters in a row. Even though he has been more successful lately he is still having growing pains which could keep him from fitting into the playoff rotation. He has been walking a lot of batters and even when he gets ahead in counts he often cannot finish guys off quickly and as a result has high pitch counts. In his brief major league experience he has made it into the seventh inning only twice and not at all since August 20th. Probably the least likely to get himself into the playoff rotation but maybe the best suited for it is Ian Kennedy. He has only three games of major league experience, but during that time has done extremely well for himself. 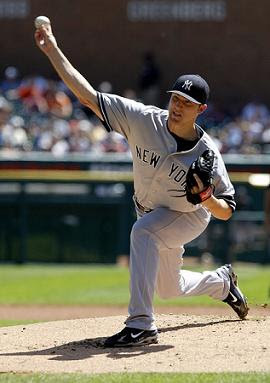 He has pitched 19 innings at the major league level and during that time has a 1.89 ERA and 15 strikeouts. The problem is that 19 innings is not a whole lot to judge a major league career by. His minor league numbers are impressive, since being drafted in the first round in 2006 he has an ERA of 1.91 and 163 strikeouts over 146 1/3rd innings of minor league experience. He started the season at the single-A level and rose quickly through the system and was the guy who replaced Mussina after his late August struggles. There are two big questions that come attached with Kennedy, first, is his major league success simply beginners luck and second, does he have enough experience to pitch during the playoffs? Who will Joe Torre choose? "If it’s close, experience will put me over the line," Torre told the NY Daily News. So My guess is Mussina, but if he doesn’t pitch well between now and October then its anybody’s guess. You can read all of my articles and more at Hot Stove NY.